Let the Quartermile Residence be your home away from home the next time you plan a visit to Scotland’s vibrant capital. This chic, stunningly presented 1 bedroom property is located in the opulent Quartermile area - a mere stone’s throw from the prestigious Edinburgh University and a short stroll to Princes Street. Sitting pretty in an upmarket development, this modern pad sleeps two guests in style. 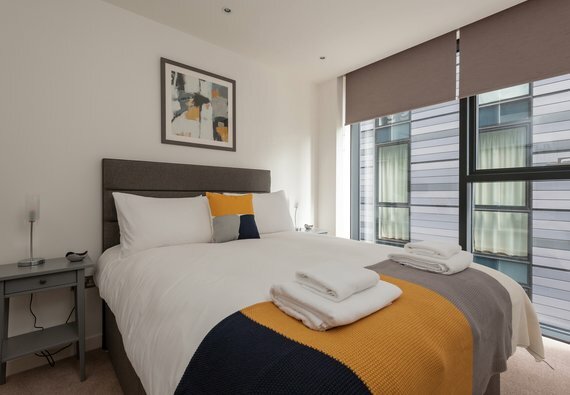 With sleek, thoughtful decor throughout, and all the mod cons the discerning traveller could ask for, we guarantee you’ll be the envy of your friends after a visit to the Quartermile Residence. Modernity meets artistry in the Quartermile Residence’s sleek living area. Sink into a glorious corner sofa and put your feet up after a long day painting the town red. Thoughtful decorative details complement the space, and enormous windows provide a glorious amount of light. If you’re the next Gordon Ramsey, or you simply feel like whipping up a tasty meal before some more exploration, you’ll love the Quartermile Residence’s stylish and contemporary kitchen. The spacious kitchen is a vision in white, with gleaming countertops and inclusive utilities, including a dishwasher and washer-dryer - bliss! When it’s time to let yourself drift off into dreamland, head in to the dreamy double bedroom. A family bathroom with shower over bath completes this gorgeous property. Exterior This apartment forms part of a luxury modern development. Interior layout A central hallway leads to living room with adjoining kitchen, master bedroom, and family bathroom. We come to Edinburgh a few times a year and always like to try different apartments. We loved this place and will definitely be back! It was very clean, everything luxury quality, and perfect location. I stayed in this apartment last week when in Edinburgh on business. I travel a lot with work and so stay in a lot of properties and this is definitely one of the best I've been in. The little touches are done just right - great shower, strong wifi, high quality sheets and towels - which makes being away from home much more bearable. The Quartermile complex is great, nice and modern with some good amenities like a Sainsbury's, Starbucks, restaurants etc. It's really central so I actually managed to see a bit of the city in the evenings which makes a nice change, and there's a huge park behind which was great for a morning run. I'll definitely book this place again if I'm back in Edinburgh for business or a holiday. Great! We always use Reserve Apartments and have never had a problem. The apartment was absolutely perfect. It was spotlessly clean, had every everything we needed and David and Reserve Apartments could not have been more helpful. We always use holiday lets over hotels, and this one really felt like a cut above the rest. Everything is really high end but easy to use, and none of the standard Ikea stuff you normally see. The only teeny tiny change we would make is a coat rack or hooks to put your jacket on in the hallway, but it’s not really too much bother to put them in the wardrobe. The location is amazing and within walking distance of everything we wanted to see and do. There's a Sainsbury's in the development which was really handy, and some lovely little cafes etc. Our favourite was Soderberg for coffee and pastries in the morning, delicious!